“Port Credit's finest. See for yourself...” This challenge left on the Shore Grill & Grotto’s website was accepted. Let’s see what the finest of the town has in store for us. 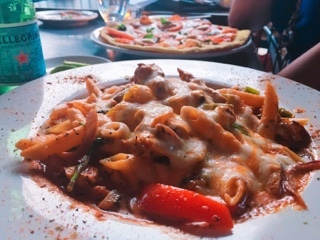 Certainly, it’s one of Port Credit’s largest restaurants: the abundant store frontage provides a huge patio; that’s even before considering the cozy lounge (with live music), huge dining room and private dining area. 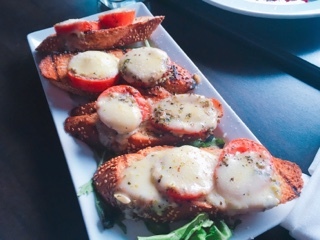 Their bruschetta ($8.71) is best described as garlic bread with cheese topped with sliced tomatoes – good if you want garlic bread, but disappointing if you’re expecting bruschetta. The dish was missing that freshness from the herbs, tanginess from a bit of citrus and overall lightness that makes it the famed bread for me. Consider sharing the cashew-encrusted goat cheese ($12.71) with a table of four as its sheer size would be a handful even for two. I wasn’t enthused when I read its description: cheese with nuts is understandable, but did it really also require roasted garlic and raspberry coulis (two flavours that shouldn’t work together). 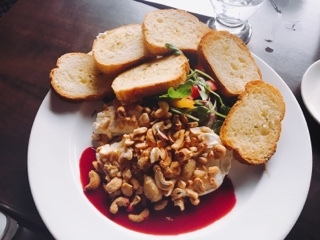 Yet, it all combined nicely, especially if you love contrasting dishes: the creamy smooth goat cheese with crunchy cashews, enhanced by the savoury sweet garlic and a pop of refreshing berry sauce. In true Italian tradition, the seafood linguine ($19.75) was huge (enough for a full plate of leftovers for my husband). 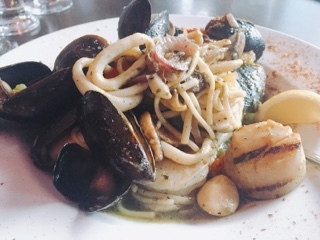 There was also a good selection of seafood that were cooked well: large and meaty scallops given a light smoky grill, crunchy shrimp, tons of mussels, along with clams and calamari. Even the pasta was slightly al dante – the building blocks to what could have been a fantastic dish. But then everything lacked flavour … unless you count a quarter-cup of olive oil a predominant taste. The pesto sort of peeks through, but the acidity from the white wine you’d want to cut through the greasiness is non-existent. Some say lower sodium is good for the health, but for me I want taste (or at least a shaker at the table so I can kill myself). And as much as I love roasted garlic, the sheer amount was overpowering having had a few of them whole after mistaking them as fallen crustacean. For me, the Shore is definitely not Port Credit’s finest, although it wasn’t horrible either - the restaurant does have abundant portions at reasonable prices. Rather, I wish it relied less heavily on fats for flavours and more on herbs, citrus and salt. In the end, take inspiration from your name – the Shore: incorporate the salt of the sea and keep out the oil.